Find out all you need to know about Cheap Alaska Cruises. The cheapest Discount Alaska cruise we found is $599. Hurry: Alaska cruise vacations are only organized from May to September! The Inside Passenger Cruise: a roundtrip cruise from Seattle including passage through the islands offshore from British Columbia and Alaska. The Glacier Route Cruise: is a longer cruise that includes more glaciers and usually stops in a couple extra ports. Why are Alaska Cruises cheap? Compared to Antarctica cruises, your Alaska cruise seems to be a bargain. Why? Because Seattle and Vancouver are the 2 most used harbours to start discount Alaska cruises. Now bear in mind that getting to these 2 cities could cost you more than your Alaska cruise ticket only. The cruise season for Alaska runs from May to late September. May and September tend to be cheaper months to cruise. Why? there is less chance of seeing some of the beautiful Alaska wildlife along the way! According to your reference, Alaska cruise lines offer you large, mid-sized and small ships. Find below a list of cruise lines ordered by ship size. large and mid-sized Alaska cruise ships carry between 700 to 3000 passengers: they have all the extra amenities you could ever wish for. They are your first bet to offer a cheap Alaska cruise tour. small Alaska cruise ships carry between 12 to 200 passengers: they provide a much more personal Alaska vacation! Bigger cruise liners also offer heated indoor or outdoor pools. So it’s all much more a summer feeling compared to when you visit Antarctica. Radiance of the Seas organizes seven-night North- and Southbound routes between Vancouver and Seward, Alaska. Seattle to Alaska Cruise: Rhapsody of the Seas returns to Seattle cruising on seven-night roundtrip Alaska Fjords and Glaciers. Vancouver to Alaska Cruise: Serenade of the Seas sails a seven-night roundtrip from Vancouver including a visit to Alaska Hubbard Glacier: the largest and most active glacier in the world. Radiance and Serenade also offer a 14-night Ultimate Alaska voyage for an extensive adventure in Alaska. Seattle to Alaska cruise: Star Princess and Golden Princess will offer a cheap cruise around Alaska for 7 days sailing the Inside Passage. San Francisco to Alaska Cruise: Dawn Princess offers 10 day cruises of the Inside Passage. Diamond, Island, Sapphire, and Coral Princess will be sailing between Vancouver and Whittier on the "Voyage of the Glaciers" itinerary. Tahitian Princess will offer an Alaska cruise package with more ports and sightseeing’s on a longer – 14 days- journey. Holland America Alaska cruises sail with mid-sized 1200 to 1800 passenger cruise ships. Seattle to Alaska cruise: Amsterdam, Oosterdam and Westerdam start a 7 day roundtrip to Alaska. San Diego to Alaska cruise: Ryndam and Veendam start from San Diego and will sail longer to reach Alaska. Vancouver to Alaska cruise: Ryndam, Statendam, Volendam, Veendam and Zaandam cruise ships offer 7 day Alaska tour cruises. Seattle to Alaska cruise: Norwegian Cruise Line newest ship: Norwegian Pearl will join the Norwegian Star in sailing roundtrip cruises from Seattle. Vancouver to Alaska cruise: The Norwegian Sun will embark from Vancouver on a 7 day roundtrip. All three Norwegian cruise ships will be sailing "freestyle cruising" to Glacier Bay, Sawyer Glacier, or "Alaska Adventure" itineraries. My preference is visiting Alaska on a small ship. Why? they offer a more exotic, out-of-the-way itinerary to Alaska. Logically small cruise ships are usually more expensive, fill up much faster and sometimes have less amenities on board. Then again if you want to get up close to Alaska, you will be more interested in the things outside your ship! From a 4-day cruise to a 25-day odyssey no one gives you more Alaska cruise choices than Cruise West. From routes along the Inside Passage to destinations on the Bering sea, their beautiful small ships explore Alaska the Cruise West way : up-close, casual and personal. 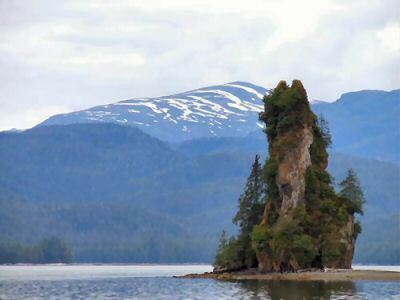 Departing from Seattle or Juneau, American Safari offers luxury alaska cruises. They sail five ships all offering suites: some have real bath tubs, queen-sized beds, and private balconies. Their Alaska vacations are 8, 9 or 15 days long. sometimes a few dolphins along the way. The weather in Alaska is usually between 50 to 80 degrees F or 10 to 27 degrees C between May and September. June and July offer the longest times of daylight ranging all the way up to 20-21 hours a day. This gives you more opportunities to see glaciers and the wonderful wildlife along the way. The weather is unpredictable so take multiple layers of clothing, a waterproof warm jacket, rain gear, light gloves, sweaters, sun glasses, and a warm hat. Don’t forget to bring good walking shoes! Please leave a comment if you still would like to gather more info about your next cheap Alaska cruise! For an Antarctica travel with the most adventure, good food and basic but warm accommodation. My Hurtigruten (Norwegian Coastal Voyage) 2004 affordable Antarctica cruise vacation to the South Poleon the Norwegian fjords cruiseship: Ms Nordnorge.